When it snows, City of O’Fallon crews work around the clock to get motorists moving as quickly as possible by efficiently clearing more than 700 "lane miles" of pavement and 1,100 cul-de-sacs. For safety's sake, always stay clear of snow plows. In general, the City has designated 14 zones or routes and will place 1, 2 or 3 snow plow drivers in each of these routes depending on the severity of the storm. The crews will work in 12-hour shifts day and night until the job is completed. During full scale operations, each 12-hour shift can have up to 46 drivers (92 total drivers). The two best things residents can do to help in the snow removal effort is to first move any parked cars off the street out of the way of snow plows and emergency vehicles and second not travel out onto the roads until they are completely clear. O'Fallon's Municipal Code expressly forbids parking on City streets once accumulating snow or ice begins. Violators may be ticketed or towed. Please keep the streets safe and park in your driveway! With any winter weather event, parking on City streets becomes problematic in maintaining efficient and effective snow/ice removal operations. Parked vehicles slow snow/ice removal operations and create situations that impede street clearing operations depriving residents and the traveling public of safe and efficient travel. Similarly, emergency response will be affected. As such, the following regulations shall apply to parking on City streets during any winter weather event. Once in effect, a prohibition under this Chapter shall remain in effect until terminated by announcement of the Mayor or City Administrator, except that any street which has become substantially clear of snow and ice for the length of the entire block shall be automatically excluded therefrom. Snow control operations during the storm and after the storm are different. During the storm, crews will constantly cycle through their assigned streets trying to maintain at least one clear path (room for one car width) on the streets. After the storm, drivers will first establish that clear path on all their assigned streets; then, begin a process of widening this to get a clear path for two-way traffic. Then, will continue the widening to get the pavement cleared close to the curbs on both sides of the street. You should expect that the plows will come down your street many times until the job is done. After the streets are cleared close to the curbs, drivers will go into a clean-up phase where they will go around and improve areas that were not done well earlier. At this point they will also be cleaning up intersections and, when we receive more than 4 inches of snow, cul-de-sacs. The goals of snow control operations are to have Collector and Arterial Streets cleared for two-way traffic within six hours of the end of the storm and to have a clear path (the width of one car) on all residential streets within 12 hours of the end of a storm. The widening out of streets and clean up phase will continue 24-36 hours after the end of a storm. The City's Snow Plow personnel are required to attend yearly training on refreshing their snow plow skills, as well as learning their snow plow routes every fall. All vehicles must be removed from the lot within 24 hours after any parking ban is lifted. The City does not plow these lots until AFTER all streets are cleared. Lots may be snow/ice-covered while your car is parked there. The City is not responsible for any damage to your vehicle while it is parked on these lots. These lots may not be patrolled during a snow storm. Please do not leave any valuables in your vehicle as the City can not accept responsibility for any items or vehicles that may be lost or stolen while parked in these lots. What roads are cleared by the City of O’Fallon’s crews? The City of O’Fallon is responsible for clearing most streets in O’Fallon’s City Limits, including major thoroughfares such as Mexico Rd, Feise Rd, and Bryan Rd. However, several Interstate and State Highways bisect O’Fallon, including I-70, I-64, Hwy. K, Hwy. N, Hwy. 79, Hwy. DD, South 364 Outer Road, Technology Drive, East and West Terra Roads some parts of Veterans Memorial Parkway. These roads are controlled by the State of Missouri and are the responsibility of the Missouri Department of Transportation (MoDOT). The City of O’Fallon cannot clear these areas. If you have questions or concerns about these roads, please contact MoDOT at 1-888-ASK MODOT (1-888-275-6636) or 314-275-1500. How many miles of streets does the City of O'Fallon maintain? The city has grown tremendously over the past 10 years. Approximately 700 lane miles of streets are maintained by the City of O'Fallon. The City of O’Fallon is responsible for clearing most streets within O’Fallon City limits, but not all. To keep traffic moving, the City emphasizes first clearing major thoroughfares for which it is responsible, including Mexico, Feise and Bryan roads, and WingHaven Boulevard. When snow begins to accumulate, snow removal crews are dispatched to residential areas. How quickly will the City of O’Fallon clear my street? The goals of snow control operations are to have collector and arterial streets cleared for two-way traffic within 6 hours of the end of the storm and to have a clear path (the width of one car) on all residential streets within 12 hours of the end of a storm. The widening out of streets and clean-up phase will continue for 24-36 hours after the end of a storm. In lighter snow events, the City often completes this process faster, but in heavy snow events, the process does take time. What can homeowners do to help speed the process along? Get parked cars off the streets and stay clear of snow plows! Parked cars along the streets provide dangerous obstacles for plows. In addition, they simply don’t allow snow fighters to do their jobs. If a car is parked on the street, that area does not get plowed effectively. It is both dangerous to drivers and inconsiderate to neighbors who are stuck dealing with snow piles left in their street. What if I don’t want to move my parked car off the street? You’re breaking the law. O’Fallon’s Municipal Code requires that parked cars be moved off the streets anytime there is an accumulation of snow, ice, or other frozen precipitation. In the past, the City asked for and received voluntary compliance to this law. However, during recent storms, this voluntary compliance has dropped, meaning snow fighters are at risk and neighbors are more inconvenienced. Therefore, any car parked on a street during a snow event may be ticketed. And, if that car is preventing snow fighters from safely completing their routes, it may be towed. No warnings will be issued. When snow and ice hit, get parked cars off the street immediately and keep them off until the roads are cleared in both directions! 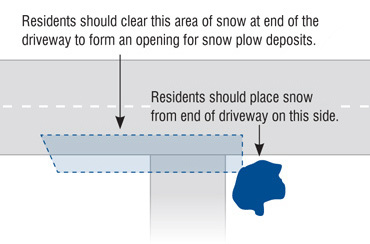 How can I keep my driveway and mailbox from being snowed-in by plowing? Unfortunately, there is no perfect solution to preventing snow from being plowed up to your mailbox and driveway, but you can minimize the possibility. Make room for snow discharged by plows by clearing the snow from the end of your driveway and along your curb, especially the area to the left of your driveway, when facing the street from the front of your house. Why do I see snow plows go down my street multiple times? Why don’t they just clear my street and then move onto the next one? With so many lane miles and roads to clear, snow fighters simply cannot spend too much time on one street, especially during a storm or in the first 12 hours after the end of the storm. Remember, every minute a driver spends on your street is a minute he/she is not spending clearing an area on someone else’s street. O’Fallon snow operations team has established 14 routes to ensure that drivers can get to every street in the City as quickly as possible. During the storm, crews will constantly cycle through their assigned routes to try and maintain at least one clear path (room for one car width) on the streets. After the storm, plows will first establish the clear path on all their assigned streets. Again, the goal for this part is to have a clear path on all residential streets within 12 hours of the conclusion of the storm. Only after a “clear path” is established on all streets will drivers begin the process of widening this clear path to accommodate two-way traffic. From that point on, drivers will continue to repeat their routes and with each pass they will widen the path to get the pavement cleared close to the curbs on both sides of the street It may be necessary for the plows to come down your street many times until the job is done. Once two lanes have been established on all subdivision streets, drivers will go into a clean-up phase where they will go around and improve areas that were not done well earlier. At this point they will also be cleaning up intersections and cul-de-sacs. It says residential streets will have a “clear path” within 12 hours of the end of the storm. What does “clear path” mean? I live on a cul-de-sac. How will the City deal with the snow on my street? During light snow events (0-4” of snow): Crews will focus on clearing a 20 foot path around the perimeter of the cul-de-sac with the blade of the plow angled toward the middle. This will allow easy access to driveways. During heavier snow events (4” or more): With the substantial amount of snow that can build up in cul-de-sacs during heavy snowfalls, additional snow control efforts have been put into place. When heavy snow hits, plows initially will create a passable lane through the cul-de-sac so residents can drive in and out of the street. Then, as other snow removal efforts wind down, crews will return to the cul-de-sac to move snow into available green space. With this new policy in place, crews will be able to focus on clearing O’Fallon’s streets as quickly and efficiently as possible without inadvertently causing large snow windrows on cul-de-sacs, which inconvenience homeowners. Due to the substantial amount of snow that can build up in cul-de-sacs during heavy snowfalls, these streets require additional snow control efforts. Crews begin by providing a single lane clear path into the cul-de-sac. Then, as other snow removal efforts wind down, crews will return to the cul-de-sac to move snow into available green space. With this new policy in place, crews will be able to focus on clearing O’Fallon’s streets as quickly and efficiently as possible without inadvertently causing large snow windrows (piles), which inconvenience homeowners. I see neighbors and some businesses clearing driveways and pushing the snow back onto the street. Can I do the same? The City has the daunting task of clearing nearly 700 lane miles of streets and 1,100 cul-de-sacs after a winter storm. Homeowners or businesses who push snow back into the street make this task even more difficult, increasing the time and cost of snow removal. Additionally, placing snow in a public street is against City ordinance and may result in a fine. Will the City clean my sidewalk or parking lot? The City cannot plow privately-owned streets or lots. Residents and business owners are required to keep their own driveways, sidewalks, mailboxes and private streets clear of ice and snow. When I park on the street, my car gets buried by snow plows. What can I do? By City ordinance, no street parking is allowed during winter weather events. No service will be provided if the crews feel they cannot safely plow your street because of parked cars or other obstructions. Can I call to report an area that needs plowing? Yes, O’Fallon’s Snow and Ice Control Hotline is put into action when the forecast calls for five or more inches of snow and snow has begun to accumulate. At that time, you can call 636-379-3826 between 8 a.m. and 8 p.m. for snow or ice control questions or concerns. Please note that the purpose of the City’s snow control program is to provide safe access, not 100% clear pavement. For questions at other times, please call the City’s Streets Division at 636-379-3807. For questions at other times, please call the City's Streets Division at 636-379-3807. Is the City responsible for damage to my mailbox, sod or basketball hoop? If your mailbox or landscaping is damaged by a City-operated snow plow, please call 636-379-3807, the City’s Streets Division, to request repairs or replacements. Or visit the Citizens First Center. Landscape replacement is not fully guaranteed; however, staff will work with you to ensure a satisfactory outcome. Please note, O’Fallon’s municipal code prohibits basketball goals and other obstructions in the City’s public right-of-way (mid-street to about 10 feet behind the curb), and the City will not pay for damage to those items. If I have an emergency, will the City plow my area first so an ambulance can get through? Call 9–1-1 only in life–threatening emergencies; the dispatcher will contact the O'Fallon Streets Division should an emergency vehicle need access to a snow or ice covered street. For more information, call the Streets Division at 636-379-3807.